We are requesting that members and friends donate items to the yard sale on behalf of Tampa NOW. 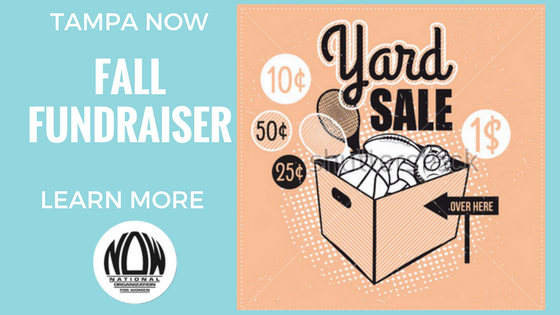 Profits from the yard sale will be used for chapter expenses. Please read the important details below, as this event is quickly approaching. One of our chapter members has agreed to allow us to use her garage to store donations prior to the yard sale at her home in Seminole Heights. For security purposes, we will not share the address on this public page. Important: If you are able to make a donation, please email us at TampaAreaNow@gmail.com for drop off and/or pick up information. We can only share the address and phone number for donations to those that contact us. Donations are being accepted 10/11 and 10/13. All donations are appreciated, no matter how small! Ask friends and family if they have items to donate as well. PLEASE, NO CLOTHING OR BOOKS AS THESE ARE NOT TYPICALLY FAST SELLING ITEMS. Note: The actual yard sale location is different than the donation location. On the day of the sale, our items will be sold at 5914 N. Tampa Street, Tampa FL from 7:00am - 2:00pm. To be part of the volunteer effort, please complete the survey here.